Hello everyone, and welcome back to another edition of Disney In Pictures, the weekly series that invites you to share your photos with all of us! My family has been to Walt Disney World several times, but so have you, so it always amazes me to see what photos you have to share. This week’s theme is “Disney From Above” — pictures specially chosen to give a birds eye view of Disney World, Disneyland, Disneyland Paris, or any other Disney venue! We’ve got a great lineup for you, so sit back, relax, and enjoy this week’s Disney In Pictures! From the Mickey Fun Wheel at California Adventure (DLR), you can see Soarin’ and over to Space Mountain and the Matterhorn! 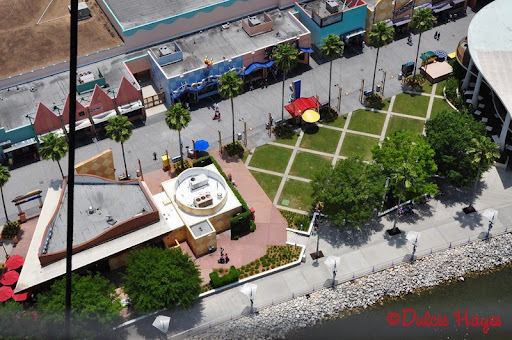 Here are 3 photos from the Characters in Flight hot air balloon ride at Downtown Disney. This has been one of the coolest things we have done so far at Disney!! It was so neat to see Downtown Disney from the air and the surrounding area. It put a whole new perspective on the grounds and actually how big the area is. When we walk around there it doesn’t seem that big but when you see it from the air you realize that it does cover a lot of ground. We went up to the highest point that the balloon could go which was around 400 ft. The day was nice and calm so we got to stay up just a little longer too, which made it worth the money. We love doing new things each trip to check off of our to do list and I’m glad we checked this one off. I’m a new addition to the Mouze Kateerz group, and saw your call out for “from above” pics of Disney… thought I’d share with you a couple that I like. 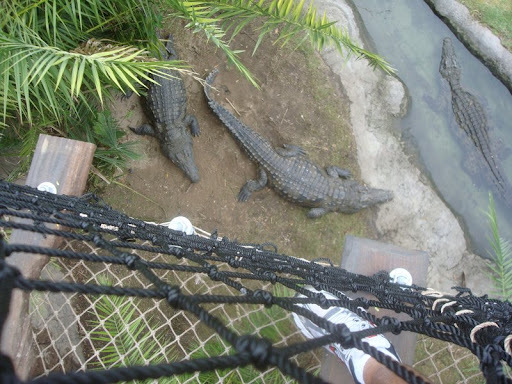 The second picture with the crocs was taken on the Wild Africa Trek in Animal Kingdom. My wife, The Lovely Steph Leann, and I were some of the first people to take the tour when it was offered, and we loved the rickety rope bridges that took you over the crocodile pools… well, I loved it, her not so much. I would go ahead of her, and as she crossed it slowly, I stood on the end and jumped to shake the bridge, above the crocs. She was not happy. The final picture is pretty obvious… taken in the few seconds of daylight between the slow climb of the service elevator, right before the first drop on, you guessed it, the Hollywood Tower of Terror. I try to get this shot when I can, and can snap off about 9 or 10 before we drop–but usually only one or two turn out because its such quick movement. Anyway, I hope these fit the theme! Denny, I loved the Skyway, it is one of the things that I wish Walt Disney World still had, and I even wrote a post about what I would bring back! In addition, the Swiss Family Robinson Treehouse is one of my favorite attractions, and I go up in it as often as I can when we visit. Here is a picture I took from the top. Enjoy, and thanks for sharing your photos! 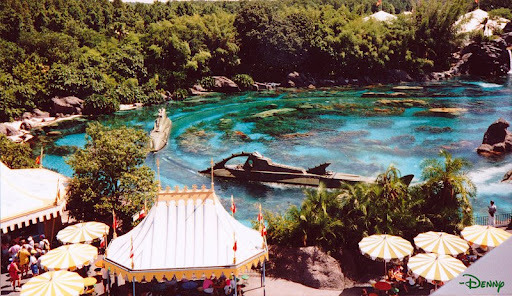 This photo was taken by my 13 year-old son, May 1999 at Disney’s Blizzard Beach. Seems it was taken somewhere on the stairs leading to Summit Plummet. I get dizzy just looking at it. I know for certain I will not ever see Blizzard Beach like this in person. No way. Never. 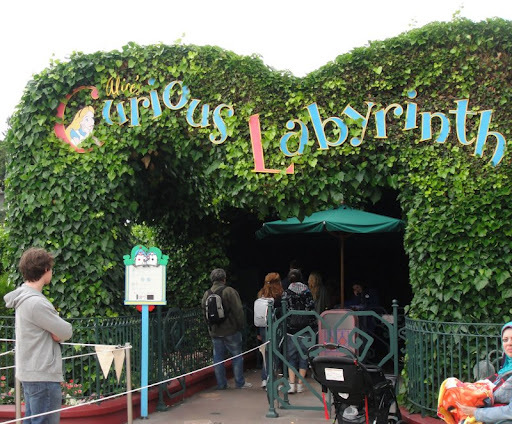 In an attraction that is completely unique to Disneyland Paris, Alice’s Curious Labyrinth is an adventurous hedge maze full of twists, turns, and finally, the Queen of Hearts Castle. Below, is the maze itself; 366 metres long (that’s almost a quarter of a mile to those of us in the US), which is themed with scenes and characters from Alice in Wonderland. My sons and I so enjoyed this bit of exercise during last summer’s trip, and just loved that this attraction was like nothing we had ever seen at a Disney Park. With the UK so close, Disneyland Paris was the perfect spot for this homage to Alice! Sitting high above the Bay Lake Tower Resort, looking out at the Contemporary and the Magic Kingdom…Magic all on its own. 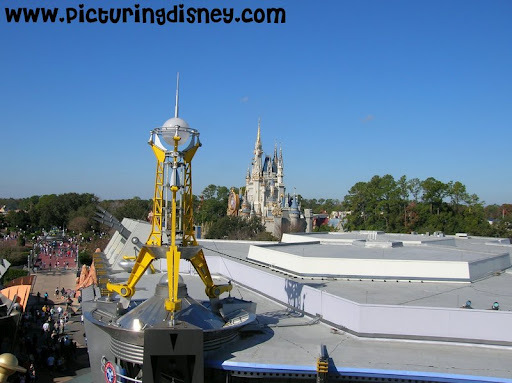 This week I’m sharing a few shots of Wishes that I took from the Contemporary CL balcony in 2008. I think it’s called “The Atrium Lounge”. It’s a tiny balcony and very high up. Once I got over just how high up we were, I could appreciate the spectacular view of the Magic Kingdom and Wishes. Debs, owner/author of www. Focused on the Magic.com. Writer for The Disney Moms, proud member of The Magical Blogorail and The Disney InsidEARS. Thanks for stopping by this week to see all of the photos my readers had to share! Stay tuned this week as we bring more posts from the World to help you remember the great trips you have had, or perhaps to help you plan for that next great trip!